The email newsletter template is used to send emails to existing customers. It is a low cost method for businesses to stay in touch with their customers. An email is sent to the customer and they receive the newsletter instantly. Businesses will save money, because there isn’t the hassle of mailing or printing newsletters involved. On many occasions, businesses spend a lot of time and resources trying to find new customers. 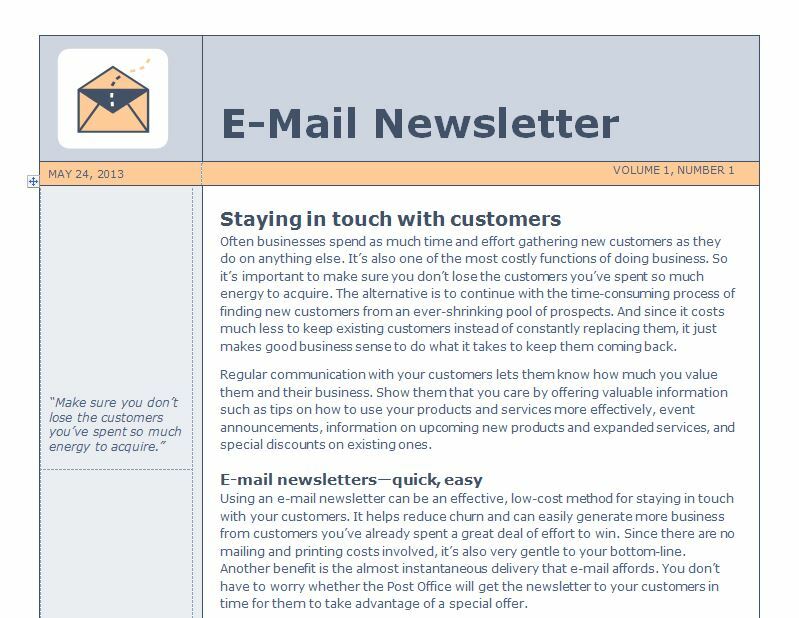 The email newsletter template will help businesses generate more money, with existing customers. When customizing an email newsletter template, the first thing to do is to add a company logo. Then choose a color that is suitable for your business. The third thing to do is add the business address, phone number and website address. Create a basic template that displays the look of your business. A readable newsletter creates a more professional appeal. This is where the fonts come in. The font size should be no more than a 2 or 3. Add articles and graphics to the template. In the article, include recent awards the company received, specials, and discounts. Put together a template that will remain the same on each newsletter. The template is available for free on this page. It is also customizable. The email newsletter template is easy-to-use and downloadable right here. First, create a Web layout view when creating the newsletter. Go to the view menu and then click on the Web layout. The Web layout is the first thing customers will see. Second use color, bold and italics on the fonts that will look professional and pleasing to the eye. Delete any feature that will no longer be used and save as a Word template. Third, the amount of information should be at least 1000 words or less. The reader will grow bored if there is too much for them to read. Include items that will be of interest to all who read it. The goal is to keep the attention of the customer. Fourth, contact information should be placed in various places in the newsletter. Fifth, the website should be placed in various places as well. Sixth, always proofread the newsletter to check for any errors.